Photography, for Bill Caro, cannot be dissociated from the hyperrealist paintings for which he is known and of which it is the main source of inspiration. 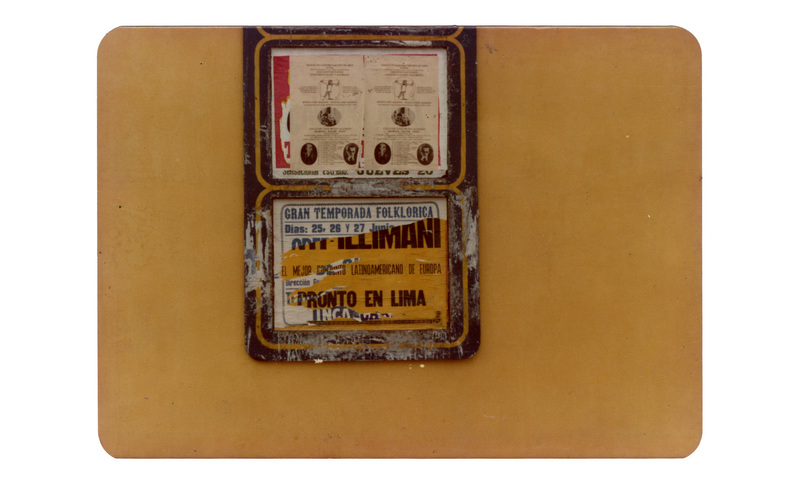 The photographs date from the beginning of the 1980s: Caro undertook to paint with photographic precision the posters defacing the walls of stately mansions in the center of Lima. Born in 1949 in Arequipa, Peru. Lives in Lima, Peru. Bill Caro studied at the School of Architecture of the Universidad Nacional de Ingeniería from 1966 to 1971, when he graduated as an architect. His talents as a visual artist led him to a first exhibition of his work in 1971 at the Galería Carlos Rodríguez Saavedra. In 1974, he received the ICPNA award for watercolor. Since then, Bill Caro has had an active career as a painter, participating in individual exhibitions, biennials, and international competitions, including the Third Biennial in Medellín, Colombia. An heir to the photorealist movement, he creates hyper-realistic paintings which imitate photography even to the point of introducing the distortions produced by the camera lens. His work reveals a deep understanding of space, compositional balance, and perspective. Frequent subjects in his work include the stately old mansions of the historic center of Lima and the shantytowns that surround the capital city.